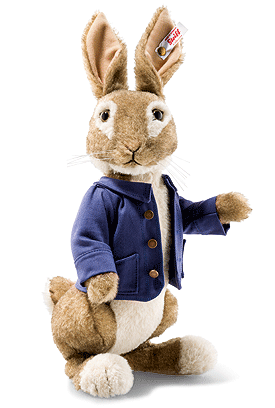 Peter Rabbit by Steiff. A beautiful limited edition item, which has been, hand made in Brown and Beige Alpaca. His head and arms have movable joints. This very special piece, carries the white ear tag, which identifies the item as a Steiff limited edition, together with the famous gold plated Button in Ear. Limited edition of only 2000 pieces worldwide. Comes in Limited Edition Box, together with a numbered certificate of authenticity. Peter Rabbit and all associated characters  & © Frederick Warne & Co Limited. Peter Rabbit, the Movie ©2018 Columbia Pictures Industries, Inc. All Rights Reserved.